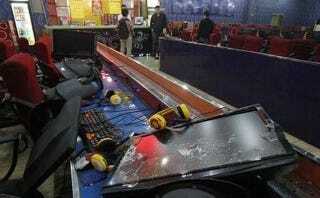 A father in Xinyu, Jiangxi province has been arrested and detained by Chinese police after going on a rampage in an Internet cafe, Tencent news reports. The detained, Mr. Lin, was celebrating his wife's birthday when he noticed his eldest son was missing. Apparently, Lin knew that his son had a penchant for Internet gaming and decided to search the local Internet cafes. Turns out Lin's hunch was right, and his son was indeed inside an Internet cafe. It was there that Lin broke down. According to Tencent, Lin picked up at a stool and started smashing computers. Supposedly he blamed the Internet cafe for his son's poor grades. As he was bashing the computers, the net cafe's owner showed up. The two began to argue and after a few traded words, Lin started wailing on the boss man. When it looked like things couldn't get worse for Lin, the police showed up. Both the owner and Lin were taken down to the local public security bureau. Despite the intervention by the police, Lin's temper didn't seem to subside. Tencent reports that Lin refused to cooperate with the police, and that at one point, he attacked an officer and spit at another one. Due to his outbursts, he's now getting charged as a violent criminal.